Crafted in high-quality stainless steel, all sizes of this frothing pitcher fit conveniently under most steam wands. 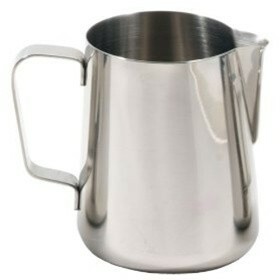 The Stainless Steel Milk Frothing Pitcher is the perfect size for quickly steaming milk for single latte or cappuccino drinks. Classic - With a classic look and feel most commonly used in cafes, you'll be frothing up drinks just like the cafes do right in the comfort of your own home. Bang For Your Buck - The quality of this pitcher will have you foaming up frothy drinks from years on end. Nothing Special - This generic pitcher will get the job done, but it doesn't give any design or advantage points. Using this pitcher is based on skill and technique since it doesn't offer any assistance in creating more foam or better foam for latte art.